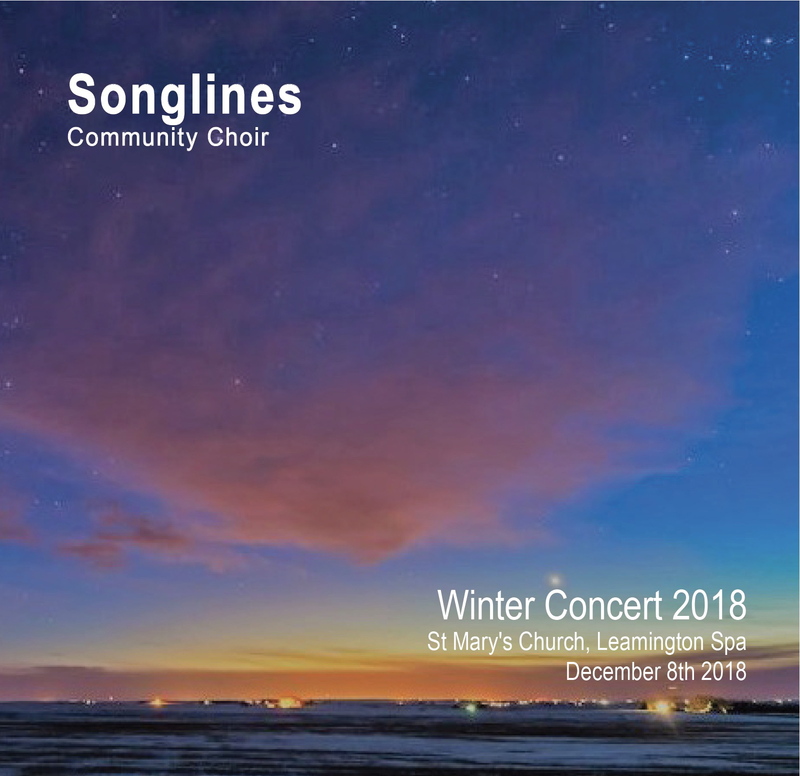 In late November 2018 Bruce Knight from the Songlines Community Choir – based in Leamington – asked me if I was interested in recording their annual Christmas Charity WaterAid Concert and producing a CD of the event. Their previous sound recordist was not available. 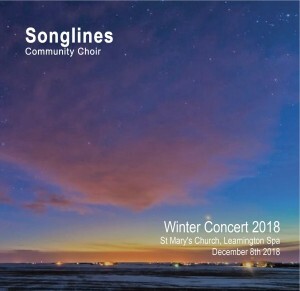 I agreed to do the recording and CD production and set about planning my approach to recording a 100 strong choir in St Mary’s Church in Leamington. I met with Bruce to find out if there were any soloists or musical instruments for accompaniment involved as this would influence how I approached the technical aspects of the recording. I learned that there were no soloists and all of the programme on the night was to be a capella. This was good news for me as it simplified the technical side quite considerably. 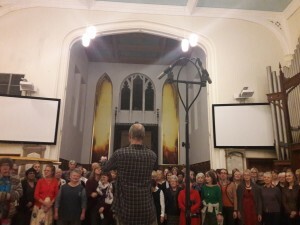 I planned to use a stereo pair of condensers to record the whole choir – and to give me more to play with in the mix I decided to use an additional spaced pair on either side of the choir. I decided to use my Rode NT5 condensers – initially I thought in an XY configuration – but then decided to go for a near coincident set up in the ORTF configuration. In the event I was unable to use this – for ORTF the mics are pointing away from each other at an angle of around 110 degrees and the capsules should be 17cms apart. On my stereo bar this was impossible – the leads from the mics got in the way of each other and meant the mics were not at the right angle or distance. In the event I went from a French stereo recording technique to a Dutch one. I decided to use the NOS stereo recording technique – this puts the mics at 90 degrees to each other with the capsules 30cms apart – perfect on my stereo bar (I usually use XY which was why I hadn’t thought about the problems with ORTF). I also wanted to use a pair of AT4033 mics as a spaced pair. I used the 3:1 rule to space them in relation to the stereo pair, the choir and each other. In theory this avoids phase issues but in reality you have to put the mics up and then tweak things around to see what sounds best in your headphones. I borrowed a Yamaha AW1600 hard disk recorder that I’ve used before for this kind of recording. Its not new but it is surprisingly well specified for a device of its vintage – you can record 24 bit if you wish (I didn’t) and you get 8 inputs on XLR with phantom power – its also very robust and reliable. I used an M Audio Duo preamp for the NT5s as I find the level of these mics too low without – but the AT4033’s went straight in. I set up while the choir were rehearsing in the afternoon. The church is originally Victorian but the interior has been recently modernised. They have removed the traditional pews and laid carpet throughout which makes it nice and comfortable and also tames considerably the natural reverberation I would have expected in a building of this age. 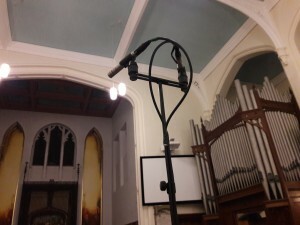 I set up my mics in front of the choir on tall boom stands set to their full extent and ran long leads to a point in a side aisle where I could monitor the performance without getting in the way. 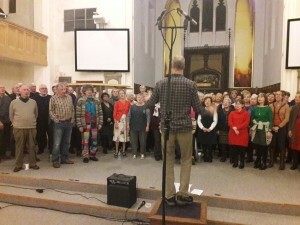 I did some test recordings as the choir rehearsed their songs. I moved the mics around to get the best sound and strongest signal. 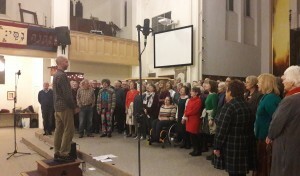 However there was one thing that later caught me out – I had placed my mics at the appropriate distance from the front of the choir during rehearsal but in performance they stood much further forward than in the afternoon. I had to make some hasty adjustments before the first number. The NT5s picked up the whole ensemble while the spaced pair allowed me to pick up the baritones on the left as I faced them and the sopranos on the right. I was pleased with how the afternoon recordings sounded – but for some reason didn’t keep them – I don’t know why exactly as in the studio I usually keep everything. This was a shame as one song in particular was brilliant in the rehearsal and didn’t quite work so well on the night. I know from live sou nd engineering how much of a difference the introduction of the audience into a space can make to it’s ambient sound and natural reverberation – even so I was surprised at the big difference in the sound in the room on this occasion when around 300 people came in to watch the performance. 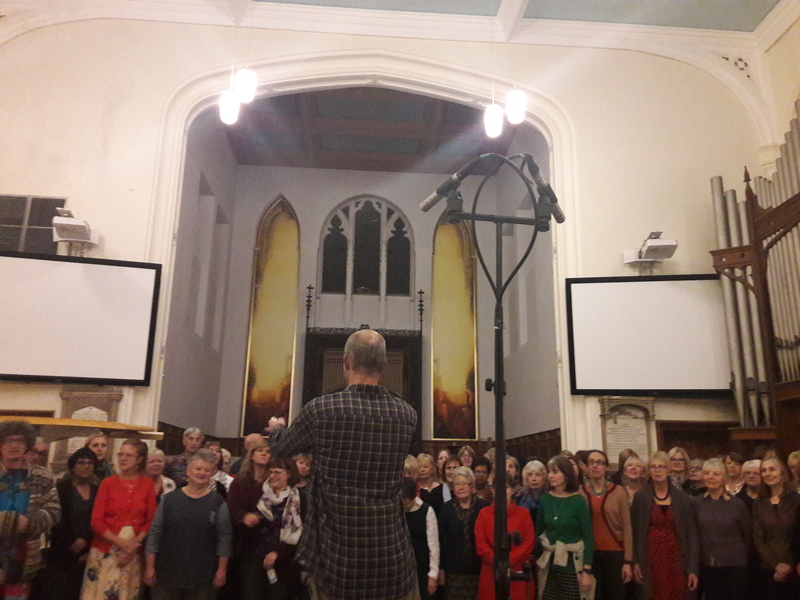 The choir were not using any PA or sound reinforcement – just the natural sound in the church. In the afternoon the sound on the recordings sounded exactly like the sound in the room: with a nice not overloud natural reverb. However in the evening the sound in the room was very different from the recording that I could hear in my headphones – much flatter and generally muddier in the church (all those bodies soak up a lot of the high frequencies) while the recording still had great natural reverb. I realised that the mics were pointing towards the apse behind the altar – its the only part of the church not modernised or carpeted – so they were picking up the natural reverb from the stone walls and floors there. 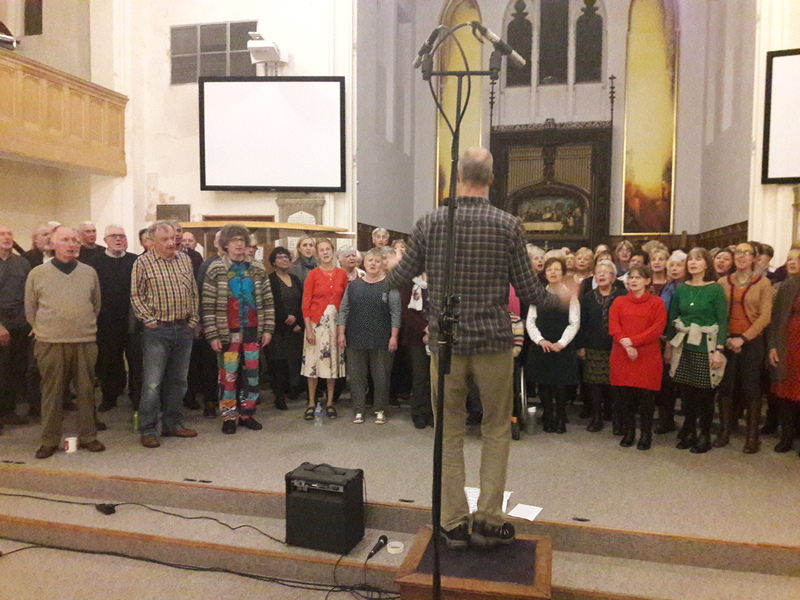 It may mean that the recording I produced for the CD actually doesn’t sound quite like it did to the audience in the church on the night – although I hope it sounds better! After the event I took the recording back to my studio and dumped all the audio files into Logic. I had decided that this was not a recording that needed any compression or additional reverb – I wanted to keep it as close to what I’d actually recorded. As a result I used very little EQ – I shelved everything out below 30Hz on all 4 mic channels and the mix bus to remove any rumbles and just gave a very broad boost on the mix bus of 1dbB centered around 500Hz just to give a bit more weight to the middle frequencies. I did use a little automation to bring up certain vocal sections where they needed to come across more clearly and I also went into the wav forms to tame some of the audience applause – there nearly always seems to be someone at these sorts of concerts who has a very loud hand clap and is always very close to the microphones! I used HOFA mastering software which is new to me – I can’t report on all of its functionality at this point as I only used it on this occasion to place the tracks in the right places for the correct spacing between songs on the CD duplication master. 70 CDs were produced (duplicated by Noisegate while I did the artwork and cover production) and were sold to raise further funds for WaterAid. It was an interesting and enjoyable job and I was glad to have had the opportunity to record the concert.